Join The Navy The Service For Fighting Men by War Is Hell Store - 7.000" x 10.000"
Join The Navy The Service For Fighting Men metal print by War Is Hell Store. Bring your artwork to life with the stylish lines and added depth of a metal print. Your image gets printed directly onto a sheet of 1/16" thick aluminum. The aluminum sheet is offset from the wall by a 3/4" thick wooden frame which is attached to the back. The high gloss of the aluminum sheet complements the rich colors of any image to produce stunning results. There are no comments for Join The Navy The Service For Fighting Men . Click here to post the first comment. 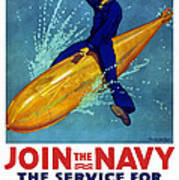 This vintage World War One poster features a sailor riding a torpedo. 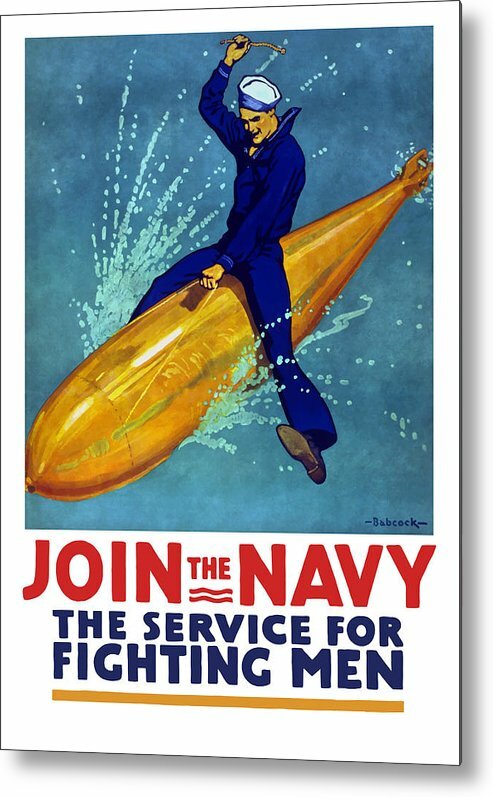 It reads, "Join The Navy, The Service For Fighting Men". 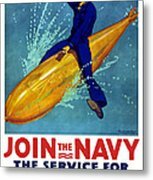 Celebrate WWI and Naval History with this digitally restored vintage war poster from The War Is Hell Store.